Shirley Wallace - Heritage Funeral Homes Inc.
of Harriston and formerly of Teviotdale has listened to the Gypsy Waltz one last time. Shirley passed away peacefully at the Caressant Care Nursing Home, Harriston on Tuesday, January 15, 2019 at the age of 90. 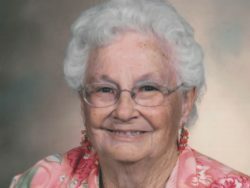 Beloved wife of the late Glen Wallace (2018) for 73 years. Remembered by her children Jean and Bob Wallace of Palmerston, Janice Bird and Syl Sloan of London and foster son Bryan and Betty Anne Colbran of Princeton. Grandmother of Terry, Rob (Tammy); Martha and Eva; Vicki and Elizabeth. Great grandmother of Allix, Jayme, Trey, Jorja, Jesse, Wyatt, Megan, Andrew and Amy. Sister of Clifford and Sharon Walker of Kitchener. Remembered by her nieces, nephews and friends. To honour Shirley’s wishes cremation has taken place. The family will receive friends at the Palmerston United Church on Thursday, January 17, 2019 from 12:00 p.m. until 12:45 p.m.
A Memorial Service of Remembrance will follow the visitation on Thursday, January 17, 2019 at 1:00 p.m.
As expressions of sympathy donations to the Palmerston Hospital Foundation or the Palmerston United Church would be appreciated by the family.